Visualists have a wide range of skills to cover. After you’re done figuring out how to create and edit content and turn it into a performance / live installation / whatever, then you have to deal with the technicalities of projectors? Video artist Maya Ciarrocchi turned me on to the site (thanks, Maya)! It’s useful for two reasons, even if you’re decent at arithmetic. First, it’s got an extensive database of obscure projectors attached to it, so you’ll prepared for whatever you run into. Second, it has adjustable sliders so you can try what-if scenarios. Won’t be long before I put all of this to use. Wednesday, I leave for Pittsburgh and the Hazlett Theater, where I’ll be in residence for a week and a half installing a custom show for choreographer Grisha Coleman, written in Processing and Java. I expect this will be a trial-by-fire for me as far as projector setup and installation, with one computer display and five projectors, all in unusual locations. I’ll be sure to report back on what I learn, including what I learn the hard way. 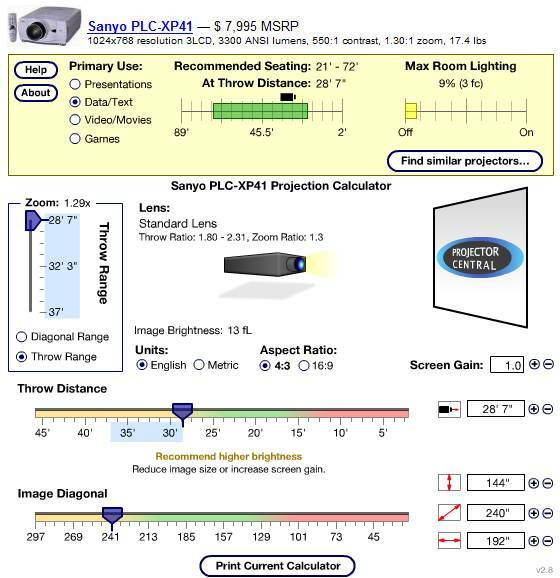 How about you: got a preferred method for researching projectors and projector setup? Got some killer spreadsheet for your throw distances? Let us know in comments.